Description: This western-style train set is an adventure into the old west! 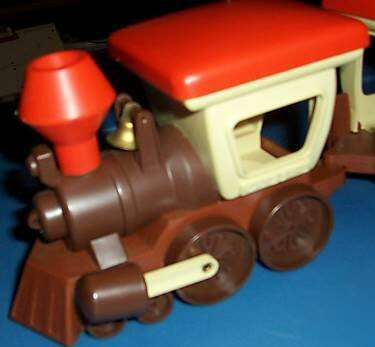 The train is about 19 inches long and comes with a set of cowboy and indian Weeble figures. Train Engine - HTW200 - Train engine with a brown base, dark brown boiler and wheels, a red smoke stack on top, and a metal bell on top of the boiler (between the smoke stack and engine's cab). The off-white cab area has 1 seat a window on 2 sides, and a small square roof opening. 3-seat Passenger Car - HTW201 - Off-white 3-seat train passenger car with a brown base and 4 black wheels. Two sides of the car has 3 open windows. The top has a large rectangular roof opening. 2-seat Passenger Car - HTW202 - Off-white 2-seat train passenger car with a brown base and 4 black wheels. Two sides of the car has 2 open windows. The top has a small rectangular roof opening. Train Engine Roof - HTW203 - Small square red roof (no lithos). 3-seat Passenger Car Roof - HTW204 - Large rectangular red roof with a litho on the 2 long edges. 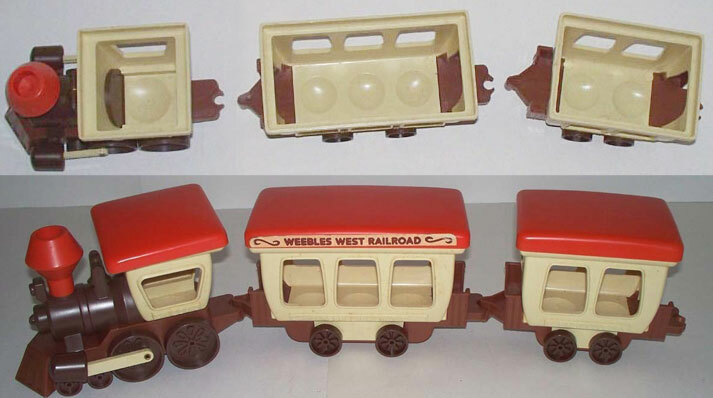 The lithos are marked "Weebles West Railroad". 2-seat Passenger Car Roof - HTW205 - Small rectangular red roof (no lithos). 2 each - HTW206 - Tan cowboy hat. The top of the hat is flattened. 1 each - HTW195 - White cowboy hat. Measures 1-3/4" long x 1-1/2" wide x 1/2" tall (to top tip of hat). HTW13 - Western Dad - Brown base, brown top (hair) western cowboy man with an orange checkered shirt, white scarf, and yellow vest. The brown top (hair) area has 2 small rectangular holes (to attach a cowboy hat). Marked, "©1974 Hasbro". Measures 2" tall. HTW14 - Western Boy - Blue base, brown top (hair) western boy with a red shirt, blue checkered scarf, a white vest, and holds a white rope in one hand. The brown top (hair) area has 2 small rectangular holes (to attach a cowboy hat). Marked, "©1974 Hasbro". Measures 1-3/4" tall. HTW15 - Western Girl - White base, red top (hair) western girl with an orange scarf, and a yellow vest with orange flowers. The red top (hair) area has 2 small rectangular holes (to attach a cowboy hat). Marked, "©1974 Hasbro". Measures 1-3/4" tall. HTW16 - Native American (Indian) - Yellow base, brown top (hair) Native American Indian boy with a yellow headband and red/white feather, a brown vest, and holds a bow in one hand. Has a red/white/yellow pack of arrows on his back. Marked, "©1974 Hasbro". Measures 1-3/4" tall. Featured in 1975 Sears Christmas Book (page 487) - Price $7.88. Featured in 1977 Sears Christmas Wish Book (page 491) - Price $8.66.